BP and the federal government: ‘unlikely partners’? 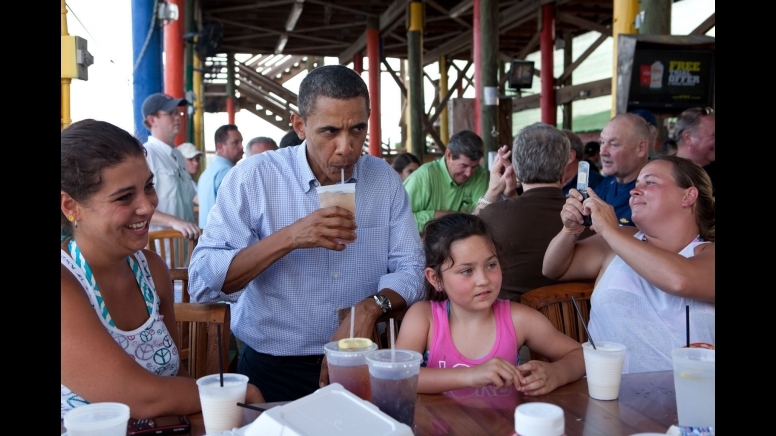 President Obama determinedly trying to remember what it feels like to care. Blah, blah, blah, boilerplate, talking point — wait, hold on, what the hell did he just say? It’s in “all our interests” that BP continue to prosper and thrive even after it just caused the worst environmental disaster in US history? Sorry, but I don’t think the average American ought to much care about the future of a multinational corporation that declined to spend the 10 hours it would have taken to cement and stabilize the deepwater well that eventually exploded and killed 11 people, all because the potential loss in profit meant CEO Tony Hayward would have had to wait two more weeks to remodel his third kitchen (in his fourteenth house). Under the “free market” that we certainly do not have but to which Obama occasionally pledges his allegiance, companies that do Very Bad Things should — and this is obviously just in theory — have Very Bad Things happen to them in return. Bankruptcy, maybe, with the company’s assets divided up amongst the victims of its malfeasance. Obama apparently doesn’t feel the need to elaborate, though, on why it’s in “our” interest that BP continue to be BP; on why, like AIG, it also is “too big to fail.” Like the rest of the Washington political establishment, he appears to take for granted that it’s necessary and just. BP is a major corporation — one of the 10 biggest in the world — with quarterly earnings to die for (not funny), ergo it should always remain that way. Too many people with too much money need it to be that way. As the failure of Lehman Brothers showed, no company that was ever once profitable and influential should be allowed to fall by the wayside, lest by upsetting the status quo our golfing buddies be forced the indignity of sending their little Johnny to public school along with the rest of the dirty, nose-picking proles, or so the thinking probably goes; when elites justify policy decisions by pointing to the need for “stability,” remember they’re likely thinking in terms of them and their friends’ social status. A silly question, though: were you or I the subject of an ongoing investigation for possible criminal wrongdoing in the deaths of nearly a dozen people, countless wildlife and the livelihoods of many Gulf coast residents, ya think the president would be declaring how important it is for everyone that we, the accused, continue to be as “strong and viable” as we were before the alleged crime? To ask is to . . .
And that silly question brings me to the silliest headline/lede of the month, courtesy, as one might expect, The Washington Post. “It was a marriage of necessity, awkward from the start,” the paper’s Joel Achenbach says of the relationship between oil giant BP and the Obama administration in the wake of the worsening ecological disaster in the Gulf of Mexico. The headline? “Oil spill makes unlikely partners of BP and the federal government“. To say the partnership between BP and the federal government is “unlikely” is about as naive a thing as one could write; it’s like remarking how “surprising” or “disappointing” it is that Obama hasn’t rolled back the power of the presidency since becoming . . . president. The Defense Department, the single largest energy user in the US with a carbon footprint greater than many countries, purchases the majority of its oil and gas from BP. The deepwater rig that exploded and is now leaking as much as 60,000 barrels of oil into the Gulf per day was leased by BP from the federal government, which decided on the behalf of us — thanks guys! — that it was in the national interest that the company be able to drill in public waters for private gain. And let’s not forget that in 1953 the Eisenhower administration actually helped overthrow the democratically elected government of Iran because the uppity bastards decided it maybe wasn’t such a good idea to grant a company run by a foreign government — BP, then known as the Anglo-Iranian Oil Company — a monopoly over the country’s oil resources (commies!). You almost get the sense that the verdict’s already been decided — BP’s here to stay, folks, and there ain’t nothing no criminal investigation can do about it — and that, like with regulatory oversight of the oil industry, the response to the spill from the both the government and the corporation (an increasingly artificial distinction) has had a lot more to do with show, with theatrics, than anything else. Like it has more to do with preventing the masses from grabbing their pitchforks than holding corporate power accountable. Silly, I know. This entry was posted in Barack Obama, BP, Corporatism. Bookmark the permalink. 2 Responses to BP and the federal government: ‘unlikely partners’? Well, they do say that to make money from stocks, you have to buy low and sell high rather than the other way around, so I bought BP last week. The stock is correctly valued at half of its peak if and only if there is some danger of the company being held responsible for the harm it has done. What a relief to see yet more evidence that this will not happen. I was also pleased to learn recently that the DHS is helping to suppress news from the Gulf.Perhaps the 'progressives' who voted for him are disappointed, but at least my faith in Obama has not been misplaced. "John," I went and checked out your blog. Thanks! I never realized one man could fit so many power tools inside his urethra.Of course, you've got your whole family helping, so it's really a group accomplishment.Good luck with the hospital bills.